With the earth warming, and weather patterns becoming harsher, drought and water scarcity are becoming a fact of life for many people across the globe. But that doesn't mean you can't have a garden, you just have to get smart about using your resources! Shouldn't gardens be earth-friendly anyways? 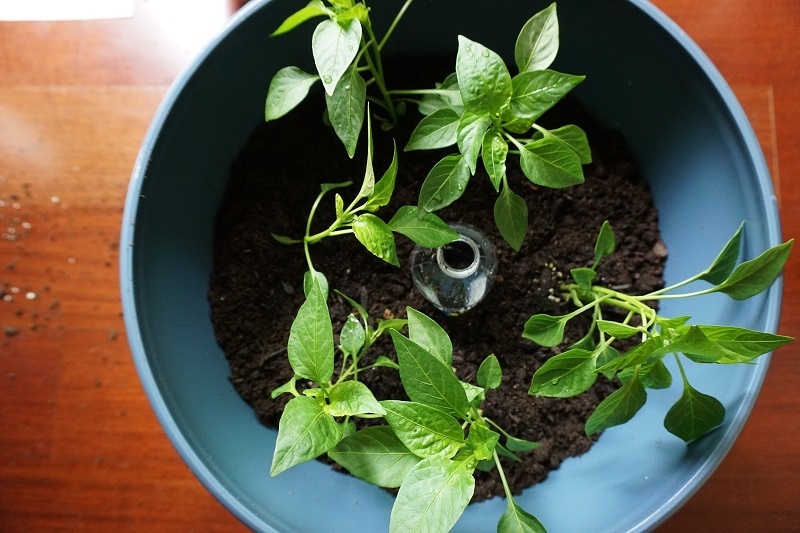 Here are three clever sustainable gardening ideas to help conserve water and reuse scraps. Hugelkultur is a very specific way to compost. Natural debris, such as fallen wood and plants, make up the insides of a 6-8 foot high, mountain style raised bed. After you add dirt over the debris, you can plant your veggies and fruit all over the hill. Hugelkultur gardens work well in areas with poor drainage and other challenging spots. Since it's in a shape of a hill you also get more room to plant using smaller square footage. Imagine what automatically happens in a forest as debris decays and plants grow on top of the nutrient-rich pile. That's exactly what happens inside your hugelkultur raised bed. As it decays inside it naturally feeds your plants! Hugelkultur raised beds not only provide a compost pile for your plants to feed on for years but you also don't have to water it as much. Learn more about how to build a hugelkultur raised bed here. 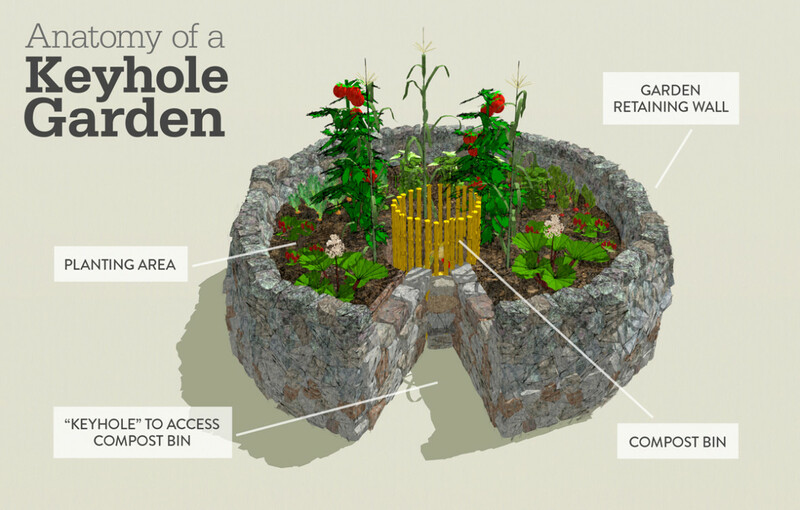 In Africa, where it is dry and irrigation is a challenge, keyhole gardens are popular. They look like an old-fashioned keyhole with a notch on one end if you view it aerially. The notch allows you to walk up to the very middle of the garden and pour in compostable items. Then when you water the garden through the middle compost area (usually built with sticks to allow nutrient flow) it seeps all the nutrients to the rest of the garden. Building a keyhole garden is fairly easy, and the garden itself will be durable enough to last. You can start your keyhole garden only a foot off the ground and each year simply build over the old garden. The biggest advantage to a keyhole garden comes in the form of the notch that holds the compost. This notch enriches the soil and also gives you a pile from which to pull nutrient-rich soil to replenish the growing base in future summers. A container garden takes the same concept as a raised bed but does it in a smaller space that can be located on even the smallest of patios. Almost anything you can grow in a garden, you can grow in a container. Though I've found the best veggies for a container garden are ones that produce a lot on one plant, like tomatoes, peppers and peas. In order to really make a container garden sustainable I place compostable items about halfway up a 16-inch container before filling it in with soil. I also like to place a plastic bottle with holes poked all around in the middle of the dirt so it acts as a drip feeder for the plants (only the drinking hole from the bottle should be above the dirt so you can add water). Go here for detailed instruction on how to make this container garden. The best design for a sustainable garden is the one that works well for your yard and your particular lifestyle. The design that works for a twenty-something single person probably won't work for a family of six, but all three of these designs are solidly sustainable. Alicia is a kombucha tea-sipping blogger who focuses on healthy and sustainable living on her family blog Homey Improvements. She also enjoys sharing her recent discoveries with DIY projects, home tips and organic gardening on HomeyImprovements.com. Connect with her on Twitter at @DIYfolks.